Dominus Ghaul is the self-proclaimed ruler of the Cabal Empire. After receiving the distress call sent by the Skyburners during the Taken War, Ghaul traveled to the Solar System with his Red Legion with the goal of claiming the Traveler and its Light for himself. He successfully carried out a surprise attack against the Last City, capturing The Speaker, destroying the Tower, and severing Guardians' connection to the Light by isolating the Traveler within a containment device. Ghaul was born an outcast orphan, both an albino and a runt, subjected to ridicule and torment throughout his childhood. As was custom for Cabal runts, he was abandoned and left to die. Instead, he was found by The Consul, a disgraced scholar and aristocrat of the Praetorate, who decided to raise, befriend, and teach Ghaul in the hopes that he would one day overthrow Emperor Calus. In particular, the Consul taught Ghaul of the Traveler and instilled in him a belief that the Cabal deserved its power by right. Ghaul knew how the Consul was using him and accepted it as a fair exchange for his upbringing. Ghaul first came to Calus's attention as a new fighter in his coliseum. His albinism, combined with his singular skill and measured, patient approach to combat, quickly made him the Emperor's favorite Gladiator. Calus would amuse himself by forcing those who had displeased him to bet against Ghaul, while he bet for him. However, Calus began to grow apprehensive of wasting Ghaul's skill in the coliseum, and so elevated him to Primus of the Red Legion, where he became known as the "Ghost Primus." As the Primus of the Red Legion, Ghaul quickly became indispensable to the Emperor not only for his skill in battle but also his wisdom. Ghaul soon found himself as the right hand of Calus, who would often discuss his plans and ideas with Ghaul to refine them and temper the Emperor's passion with discipline. Ghaul grew close with the Calus as well, confiding in him how he believed the adversity he had faced throughout his life shaped and strengthened him into the warrior he became. Despite the growing friendship between Ghaul and Calus and the close trust and faith the Emperor favored him with, Ghaul's loyalties remained with the Consul and he utilized his position to began plotting a coup against the Emperor with the aid of what remained of the Praetorate and a number of Calus' closest allies and advisers. Among the allies he gathered were Calus' own daughter Caiatl, Evocate-General Umun'arath, Calus' bodyguard Shayotet, and Freeborn Otzot, who feared losing her status should Calus free all Psions from slavery. Calus grew concerned about Ghaul's activities and dispatched a spy to follow him, although he did not know the true extent of Ghaul's plans. Ghaul's plans were complicated by the surviving members of the Praetorate, who sought greater control over him and tried to delay his coup for a more advantageous moment. Ghaul ignored their efforts and rejected their attempts to rule over him, and chose his own time and place to remove Calus from power. Alongside the Consul and the Red Legion, Ghaul personally invaded Calus' palace on Torobatl in the middle of a late-night court celebration and arrested him, with the aid of Caiatl and Shayotet ensuring that Calus' was caught off-guard and unable to resist. Under the cover of darkness, the Emperor and his remaining military supporters were marched into The Leviathan, sealed within, and exiled far into space along a pre-programmed course, as he was too popular to openly execute. Ghaul found himself unable to look into Calus' eyes during the coup and exile, although Calus was unsure why and thought it could be due to shame. With Calus gone, Ghaul titled himself Dominus and declared himself the leader of a new Cabal regime, where there would be no more emperors and where everyone could attain greatness if they worked hard for it. Under his direction, the Cabal militarized and became a conquering, expansionist empire, and the Praetorate regained little of the power it had held before Calus, although the Consul remained Ghaul's advisor. Ghaul eliminated much of the decadence of the Empire in favor of perfecting the Cabal into what he viewed as an ideal war-driven form. Knowing that Calus remained alive and a potential threat to his rule, Ghaul took steps to hide his movements from the exiled Emperor in an effort to keep his plans secret. Centuries after taking power in the Cabal Empire, Primus Ta'aun of the Skyburners legion sent a report to the Cabal High Command detailing the destruction of Fleetbase Korus on Phobos at the hands of a Hive fleet led by Oryx, the Taken King. This report reached Ghaul who gave Ta'aun explicit orders to board the Dreadnaught and eliminate Oryx. Following the taking of Ta'aun and the deaths of Valus Mau'ual and Valus Tlu'urn, Cabal forces on the Dreadnaught sent a detailed distress signal to Ghaul. While a Guardian managed to stop the signal, Dead Orbit found evidence that the signal had reached its intended target. Dead Orbit's assertion was confirmed two years later, when Ghaul led his Red Legion in an invasion of the Last City, instigating the Red War. In attacking the City, Ghaul sought to show the Traveler the error of its ways in choosing humanity over the Cabal and establish a new order of Guardians from within the ranks of his own species. Ghaul's assault was carried out flawlessly. Taking the City by surprise, the Red Legion rapidly overwhelmed it and destroyed the Tower while his cage device latched onto the Traveler. Ghaul's forces took particular care to capture the Speaker alive, Ghaul being interested in his connection to the Traveler. In a desperate plan to kill him, The Guardian boarded his flagship, the Immortal, and destroyed its shield generator in advance of a concentrated attack. This attack never materialized, and Ghaul personally stepped out to confront the Guardian. As the two faced off, the Cage activated its suppressive shield and stripped the Guardian -- all Guardians -- of their Light. His victory assured, Ghaul beat and mocked the Guardian before kicking them off of the Immortal. Days later, aboard the Immortal, Ghaul implored the Traveler to choose him and join his empire. The Consul, in contrast, only viewed it as an advanced machine, and advised Ghaul to simply seize its Light by force. Ghaul disagreed with the Consul's approach and had the Speaker brought to him. In addition, he sent his prized warship, The Almighty, to the system's sun to destabilize it and cause it to go supernova should the system resist any further. His remaining forces have been sent to the European Dead Zone to hunt the remaining Guardians, to Io to mine the remaining energy from the Traveler and to Nessus to study the Vex. Ghaul also met with Bracus Zahn to acquire advanced weaponry for the Red Legion. He questioned the rogue arms dealer if he had brought all his weapons, who claimed he would not have made the journey to the Dominus' "throne room" without them. The flippant nature of Zhan prompted a rebuke from the Consul, but Zahn suggested that they not waste the time of their only weapons supplier. Ghaul, the Consul, and the other Legion personnel present were angered by this response, but had no choice but to deal with the Zahn. After days of brutally interrogating the Speaker, Ghaul begins to accept that to earn the Traveler's favor he would need to learn devotion and self-sacrifice but his interrogation of the Speaker is interrupted by a furious Consul. His old adviser informed him of the Guardian's efforts that has humiliated the Red Legion's forces across the system, thanks to their restored Light and has even disabled the Almighty which allows the City's remaining forces to launch an attack to liberate the City and the Traveler. With this, the Consul angrily informs Ghaul that for the first time in the Red Legion's bloody history, they have failed, all due to Ghaul's fixation with an "inert machine" and a "creature who claims to speak to it", a tone which angers the Dominus. The Consul demands that Ghaul take the Light by force to defeat their enemies but Ghaul remains adamant that he should prove his worth which leads the angered Consul to kill the Speaker and reminds him of how he brought him in and had raised him for greatness not the Traveler, from being a lowly runt to becoming the most powerful warlord in history that defeated the previous Emperor Calus and reshaped the Cabal's society and therefore he should take what is his, as the Cabal have always done. Convinced by the Consul's argument but angered by his insubordination, Ghaul throttled his old friend to death and takes his warship to the center of the Traveler Cage device to drain the Light by force. At the top of his warship, Ghaul faces off against the Guardian he defeated before but this time infused with some of the Traveler's Light, giving him similar abilities to the Guardians. However, the Light that was bestowed upon him was corrupted. After a fierce battle between the two Light-infused warriors, Ghaul was nonetheless defeated. With his death, Ghaul attempts to use Radiance, and is resurrected as a massive ethereal figure due to his corrupted Light, and he declares himself immortal as he speaks to the Traveler directly. In doing so, the Traveler wakes from its slumber, destroying the device that was harvesting its power and then destroys Ghaul himself, sending a massive shockwave across the planet and system, restoring the Light and ending Ghaul's threat forever. For the first time in history, the Red Legion has known true defeat and the leader of their people, their strongest warrior and Dominus, is now dead. Despite Ghaul's death and the liberation of the Last City, the Red Legion continue to carry on the Red War but have become seriously weakened and demoralized at the loss of their leader. "Do you see all that I have done?" Ghaul is adorned in large white armor with red and gold detailing, and is often seen without a helmet, sporting a metal facemask instead. He also has albinism, given his pale skin and deep red eyes. Ghaul appears to be an adept strategist, choosing to launch his invasion during a severe thunderstorm that concealed his warships from visual detection until it was too late. Ghaul also managed to accomplish, in the span of several hours, what the other races could not do in centuries, to conquer the Last City and scatter the Guardians. 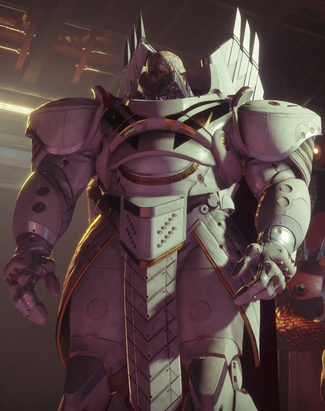 Thousands of years prior, Ghaul also managed to lead a united military coup against Emperor Calus single-handedly, demonstrating his adept skills and charisma toward his people. On the battlefield, Ghaul is a ruthless and domineering 12 foot tall warlord, taller than most of his kind, going as far as to conquer an entire civilization at the behest of his people's benefit, demonstrating a cold lack of care and sympathy for other alien races outside of the Cabal, excluding the Psion and War Beast races. Ghaul is also incredibly physically strong for a member of his race, being able to effortlessly send a fully armored Titan flying into the air just by kneeing him. Ghaul is able to throw fully armored Guardians around as if they were mere toys, even putting a lone Titan onto the ground in seconds, a physical testament to his might. Ghaul also views himself with high esteem to the point of arrogance, condescendingly calling The Guardian a "creature," telling them to not to look at him afterward. In addition, he believes that he alone is worthy of the Traveler's Light and its gifts. Therefore, he feels that the Guardians don't deserve the Traveler's Light as him and his people do, displaying traits of megalomania. Despite this, he originally wanted to prove that he was worthy of the Traveler's Light rather than simply take it. He states to the Speaker that in taking the Light by force, he would be admitting his own failure in proving his own worth. In a cutscene, he speaks about his fascination with the Traveler and how he has studied it and it's movements across the stars. He is intrigued by it's ability to bestow the light upon species and how it gave immortality, through the Ghosts, to the Guardians. He questions the Speaker on how to be deemed worthy by the Traveler and gifted with immortality, wanting to put the knowledge to his own use. He is disappointed however, when the Speaker tells him that the Light can only be given to him through death. However, Ghaul was not always like this, as Calus' journal revealed that Ghaul was once an innocent orphan, who was adopted by The Consul, meant to be used as a proxy to usurp Calus and the Empire. The Consul instilled ideals of hatred and rage into Ghaul and taught him to become a powerful warrior, one without mercy. However, though Ghaul was intended to be a puppet to the Consul's group, he proved to be far more strong-willed than anticipated. In time, the group that elevated and used him, the Consul included, learned to fear him and follow his creeds. Ghaul seemingly went insane after the destruction of The Almighty, possibly due to mounting pressure upon him from his failures during the Red War, going as far as to kill his long-time teacher and friend, The Consul, after he simply questioned his objective. In his last moments, he displayed psychotic traits and tendencies, fervently yelling at The Guardian as he fought them. Dominus Ghaul is the main boss of the Story mission Chosen. He mainly attacks with a one-handed Projection Rifle for long-ranged fire and will summon a Quake shockwave when faced up close, but will constantly shift through different Light-based attacks. The first is Solar Slicer, where, like a Dawnblade, he rises up into the air and throws flaming swords at the player, which inflict a burning effect upon a direct hit. The second is a Void shield, where he will be immune to damage as he charges up the attack shortly before releasing it, creating a giant dome that slows the player down when trapped inside. The third is Arc Wrath, where he hurls Arc energy spheres, which leave behind a shockwave that deals damage over time. This constant shift in attacks makes Ghaul a dangerous foe. "Humanity never deserved the power you were given." "Do not look at me, Creature!" "I was born an outcast, left for dead." "Rejection. Ridicule. Torment. It made me stronger." "They call it the Traveler." "Beneath my mask, Speaker, is the face of devotion and sacrifice." "I will not take the Light by force. To do so would be to admit failure and I never fail!" "Look upon me. Dominus of the Red Legion. Annihilator of Suns. Razer of a thousands worlds! Slayer of gods and conqueror of the Light! I AM GHAUL! And I have become legend." The name "Gary", as Cayde calls him, has quickly evolved to a memetic status amongst the community. Ghaul is the first Cabal character to be observed fluently speaking English, and the fifth overall antagonist to do so. How he has learned a human language remains unknown. Luke Smith has compared Ghaul to Hans Gruber from the Die Hard series. Dominus Ghaul is voiced by Neil Kaplan. Ghaul was know as the Ghost Primus. More concept art of Ghaul showing a slimmer appearance and a non-albino skin tone. A concept art of Ghaul holding a Titan over the city. This was changed to Ghaul kicking the Guardian off his warship. Ghaul observing the invasion from within his warship wearing a helmet nonexistent in gameplay. Ghaul standing within the hallway of his warship. Ghaul confronts the Guardian who has infiltrated his warship. Ghaul marching toward a weakened Guardian. Ghaul preparing to kill The Guardian. Ghaul with his Blood Guard Centurions. Ghaul speaking to The Guardian. In a shocking display of his might, Ghaul kicks The Guardian off of his warship to their death. Ghaul glaring at The Guardian. Ghaul faces off with The Speaker. Ghaul seated on his throne. Ghaul after taking the Light by force. Ghaul Armed and challenging the Guardian. Ghaul depicted in Calus's journal. ↑ 2.0 2.1 2.2 2.3 2.4 2.5 YouTube - Destiny 2 – “Gameplay Premiere Livestream (US)"